The global bluetooth beacon market size is expected to reach USD 58.7 billion by 2025, according to a new report by Grand View Research, Inc. The introduction of next-generation software-based and virtual beacons is expected to boost the market demand. Bluetooth beacon is poised for large-scale adoption throughout the forecast period, with a projected CAGR of 95.3% from 2017 to 2025. Only a few percentage of this is actually analysed and draws an attention. It is for that bit attention which advertisers are struggling for every day. So, how those advertisers reach the target audience in a faster way? How can they target the right customers at the right place and right time? Well, technology is expanding and iBeacon technology is the one that can help brands to advertise their product in a faster way. The fact cannot be denied that with the evolution of Bluetooth 5.0 and location engine, iBeacon technology has made a great shift from retail to other verticals. Through Proximity marketing, it transmits data from a wireless signal or beacon devices to smart-phone. Brands like Macy’s, Coca-Cola, Target, Elle, Sephora and many others across various verticals are busy delivering a great user-experience by pushing the right to advertise at the precise location and right time. Who may benefit from proximity marketing? When shoppers enter or leave a geo-fenced or Bluetooth- enabled area, they may receive a push notification on their smartphone by the brand in that locality. iBeacon mobile app provides offers in real-time and gives a brand a higher chance to achieve customer engagement, an opportunity to provide an innovative approach and assists brands in building a strong relationship with customers’ right from their mobile device. iBeacon mobile app helps the shoppers to receive promotional and personalized offers based on the past purchases, interests, and preferences. These messages are not stored on the users’ device and don’t consume mobile data, but are the push messages that one receives similar to the app notifications one gets. So, isn’t it great to receive personalized messages and offers based on one’s interests or preferences instead of generic messages that are distracting? Apart from receiving real-time notification via proximity marketing, iBeacon mobile app helps in providing in-store navigation assistance. This low energy Bluetooth smart device can track shopper’s location to a micro-level and show them where their favourite product is placed. Isn’t this so simplified approach that can save time and efforts in locating what you want in few screen taps. Proximity marketing helps to drive an instant traffic in your store and gives an opportunity for a business to connect with potential customers immediately when they are on the verge to make a purchase. With the help of iBeacon, stores can instantly send lucrative offers and encourage shopping through coupons and discounts via iBeacon based mobile app. The discounted item can facilitate to drive more sales while the rewards ensure that customer returns to a store again at a later date. For instance, Woman is browsing the shoe’s aisle and she instantly receives the notification of 20% discount on the selected brand. Isn’t she more likely to purchase? Location-based notifications increase sales rates when it is targeted at right time. Most of the company is already using beacons and other top brands are looking to expand it in next few years. 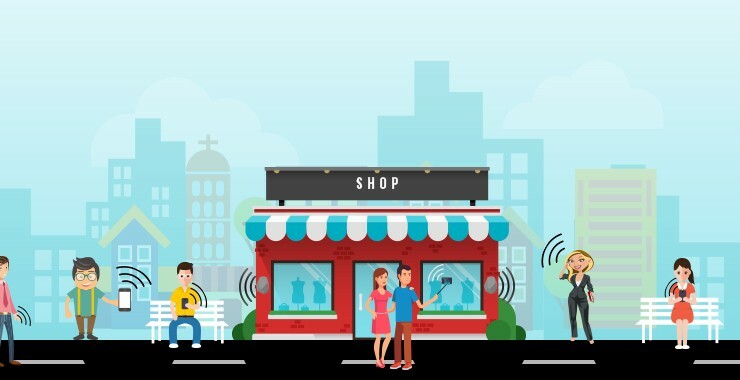 Your nearby business may be using beacons and stealing your customers by sending notifications which forces them to walk at your competitor’s door instead of yours. So, it is recommended for the brands to use iBeacon and send their own tailored message, rather than watching customers go to the competitor’s store. IKEA is one of the largest furniture retailers and uses beacon/iBeacon technology for their store in Graz, Austria to attract shoppers in their store and improve customer experience. For this purpose, beacons were placed throughout the store at the entrance, lobby, and restaurant and check-out area. Push notifications triggered by the beacons were sent to mobile shoppers who have beacon based IKEA family app downloaded. Some campaigns like FREE coffee to IKEA family members, welcome messages and reminders to use reward cards are being carried out in order to achieve a new level of customer engagement and enhanced shopping experience for their shoppers in a store. Proximity marketing gives power in the hands of the customers and they can access relevant and contextual content at their fingertips. It gives a great message to the tech-savvy customers to engage and shop in a better way thereby creating a win-win situation for both the parties. At BLE Mobile Apps, we have BLE experts who help in developing BLE powered mobile apps that help organizations to achieve their business goals. We completely focus on making bespoke solutions as per your business needs and create a world of Bluetooth Smart that empowers to create an engaging user experience.